Hum….gotta re-think the electronics in the studio for the encaustic. My hot air gun is knocking out the breaker on my electric strip and I have two electric strips going. I was being careful but, even on low speed, it did it again today. SO…I moved the gun work area over on the other side of the table and plugged directly into the wall there. SO far, so good, but I’m worried. I got DH to come in and tell me where he added new breakers for this garage when we made it into a room so long ago. HE ONLY ADDED ONE BREAKER……so the one on the wall over there is on the living room breaker and that knocks out some from the strips but I’ve got some thinking to do here. Maybe like call an electrician if I can get DH to let me. He’s one of those DYI people but he really has no time lately as he has to spend so much time over at his folk’s place doing things there. …and they have 200 acres to do on. Well…what did I expect when I plug in a griddle, a pro warming tray/palette, 2 crockpots, a heat gun and don’t even mention the tacking iron. I did get to work about 30 minutes (after heating wax for 45 minutes) before the storm warning came in saying it will be here soon. So time for lunch, huh! Tripping the breakers! That’s what happened this morning as I heated up the wax and got ready to play around again with the encaustic. Guess I had one too many appliances plugged in so it tripped my electric strip. I guess I’ll just have to get a stronger strip wattage wise or spread some of this energy about some way in the studio. My friend, Pat, came over the other day since we never did make contact as I came through Louisiana on my way home from MS. She wanted to see what I was doing with the wax… and see it in person. We had a good time playing around in the studio Wednesday night and Thursday morning. I, also, took the first ones I decided were finished out and took slides and digitals. Here are two more that I think I haven’t shown yet. 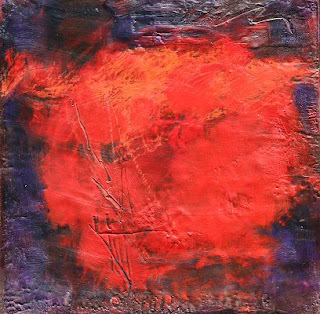 The red one is all wax and oil pigment sticks and the other is a combination of wax, pigment stick and collage elements. When I got almost through working on it, it dawned on me that I was painting that tree line base that was showing from my space at the upper pavilion at colony. It’s not often I know what I’m painting until a long time later, if ever. I’m still waiting for help on the studio lighting but in the meantime, I’ve got all the new encaustic painting stuff arranged on my 4 x 8 ft work table. My goodness, it looks like I’m going to cook in the studio with a griddle, the heating tray palette, and two crock-pots…where do I put the panels to paint on I might wonder….AND where will the big panels go when I finally ever get to doing some that are larger than 12 x 12″? I just found an email from Creativity Portal with this article I need to take to heart and paste right out there in front of me all the time when I think I should be DOING something ALL the time. The LULL. Accidents do happen, ya know! X^#)&^%H^….has anyone else every dropped a fluorescent tube ? I just did a short while ago and am trying to cool off from the frustration. One of my studio fixtures started blinking before I went to Florida….so when I was out the other day at Lowe’s I picked up a couple of tubes of the daylight replacement tubes. Should I try to install them myself….I have in the past??? DH was over at his folk’s house doing what he has to do there every week and I wanted to see what I was doing in the studio……so, after waffling around for awhile about whether I would fall while installing I put two chairs up that were about the right distance apart. Needless to say….IT WASN’T MY FAULT one of them fell out and shattered clear to the next county. And to think I’d spent the morning vacuuming around here in the house and now I may have tracked some of the glass shards on my flip-flops. 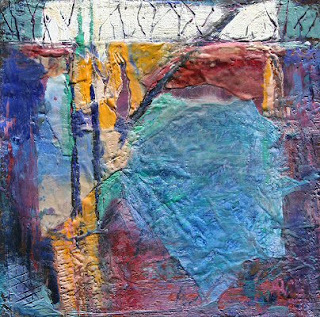 I’m taking a break right now from gathering up the big pieces but I’m afraid that these tiny little pieces may show up FOREVER over and under every nook and cranny in the studio and beyond. Where to start, where to start. I really don’t know. 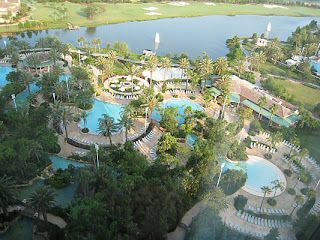 If you want to go stay at a large resort outside Orlando (and have a large wallet)…go to GrandeLakes. Beautiful grounds, many places to eat, spa, golf, etc. and near the Disney attractions. It is outside the city so have a good map and a car. This photo was taken from the 18th floor and shows a lot of the way the back looked from that viewpoint. Since I’d never been to a Disney theme park, Linda said we MUST go to the original park and off we went one day to make a day of it. It was fun and I can imagine how much fun it would be to a kid….of any age. 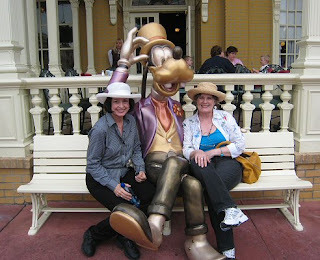 We happened upon Goofy and someone to take a picture so here you are…….kinda a Goofy shot of Linda and me and our friend. After three changes in the departure schedule we finally got back to Dallas last night and then on home today. I’m now unpacked with lots to do……….oops no mother’s day cards went out since I was out of town. The phone will be busy tomorrow.